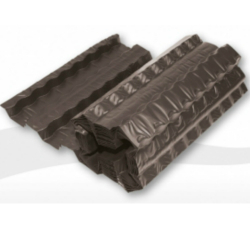 Rafter trays are perfect for direct ventilation in to an attic space by providing free-flowing ventilation above the eaves, sitting between the slates/tiles and insulation of the roof. Ventilation is an important factor in roofs, as inadequate ventilation can cause condensation/moisture build up in the roof space, eventually causing damage to the roofing timbers. Shop for rafter trays online at Ashbrook Roofing whether it’s for a new build or refurbishment job. Contact us directly for free advice on the product you need!